What is an SMS122 or MC122 pH controller? << Back What is an SMS122 or MC122 pH controller? 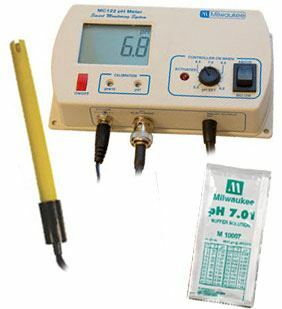 Well the SMS122 by Milwaukee Instruments is used to measure pH in a body of water such as an aquarium and control CO2 gas from a regulator such as a MA957 CO2 regulator. The MC122 is a newer model that replaces the SMS122. How does a pH controller work? The SMS122 or MC122 works on a simple principle. What it basically does is turn off CO2 gas from a regulator with a solenoid once a set point is reached. What are the benefits of running a Milwaukee Instruments pH controller? This aquarium CO2 controller will provide a stable environment for all of your fish and other aquatic animals. What happens is CO2 will cause a drop in the pH of the water. If it is too much it can kill your fish and other animals. If you use something like this unit it helps maintain a stable pH in your tank. How do we set the SMS122 pH controller up? 1. Plug in both power cords to the wall. 2. Turn unit on and calibrate the unit following the instructions using the calibration solution for the unit. 3. Place the probe in the water. 4. Plug in your CO2 regulator power cord (hopefully an MA957 by Milwaukee Instruments, but any 110V unit with a solenoid will work) into the back side of the second plug. It’s that simple. Any questions on pH controllers and their application in the aquarium or hydroponic industry let us know.